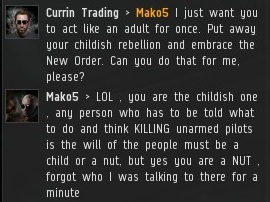 I was minding my own business one day when I encountered a troubled gentleman named Mako5. It's always tragic to see someone's entire bio dedicated to resistance against the New Order. 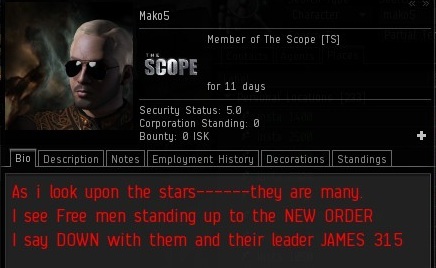 Besides his hatred for the government of highsec, what does Mako5's bio tell us about the man? It seems to me that opposition to the New Order is very cult-like, in the way that it subsumes a rebel's individual identity. 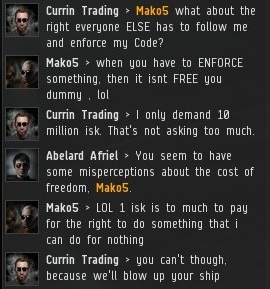 Mako5 seemed very confused, as if he thought we were the bad guys instead of the good guys. He was also mistaken about the nature of the free will of man. Why would free will prevent him from pledging loyalty to me? Wouldn't free will facilitate making that choice? Spoiled children and rebellious teenagers are known for shirking their responsibilities and resisting what's best for them. When someone agrees to the EULA and logs on to EVE, it's time to put away childish things. Responsible adults know to follow rules and help kill those who violate them. A classic fallacy of the resistance: They think they need to secure their rights by opposing our movement. This misconception of the nature of freedom has already been debunked. Democracy has a (surprisingly large) number of prerequisites, and someone needs to put into place the conditions necessary for its existence. 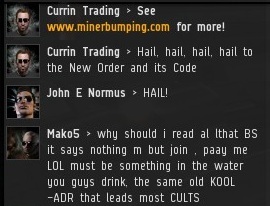 Highsec has a right to be saved from the bots and bot-aspirants. Resisting the New Order is a violation of everyone else's democratic rights. It's true what they say: Freedom isn't free. It costs ten million isk per mining character per year. As one of the founders of American democracy famously said, "Join, or die." Yeah, join or die. because you only attack ships with no weapons like right wing idiots shooting helpless deer. 'Helpless deer' cause numerous road accidents and kill thousands of people every year. One reason they issue hunting permits, due to the tendency of 'helpless deer' to jump in front of speeding cars. At night. Deer are pretty stupid, even for animals, and the analogy is pretty apt when applied to bot-aspirant/AFK miners. The funny thing is, the miners COULD fight back, but choose not to. 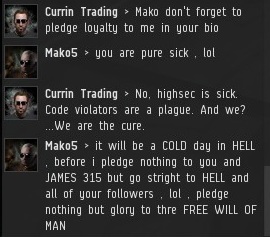 Being stupid AND cowardly is a bad combination in EVE. you know what else kill thousands of people every year? the funny thing is, the miners can't fight back when new order sits in station all day. i was in tolle a few days ago and not a single new order agent would undock because a miner was outside the station in a battlecruiser. there were five new order agents in the station. they could have easily outnumbered him. the real cowards are the ones who can only shoot afk players. Drunken asstards like you that drive drunk? Ah, EVE, with your silly space stations we can't send our DUST bunny mercs into. Yet, anyway. Welcome to hisec war mechanics, altho sitting in station and launching smack torps at idiots while sneaking up on them with alts/friends/trained attack smurfs is hardly new. Learn tactics, idiot. And hunting ganker alts is a waste of time. So don't be AFK. Come at them, brosef. But hey, I bet if you meet them in , say, Rancer, or Ammamamake, they will fight you with honor. You don't need to fight back with concord on your side you juat have to tank for what 15-16 seconds until concord arrives. That would sacrifice yield ao most miners just wont adapt. Or you could keep your yield and pay an agent 10m isk. Thats what three veldspar jet cans? Less? Come on sort it out for yourself. Oh lets drop this charade, miners who don't pay decide to not pay because suddenly there is excitement in what they do. They are exposed to a hint of what most players enjoy naturally; adrenaline, risk, the feeling that you should constantly be looking over your shoulder. Paying the fee means casting away this new-found excitement (which they crave - the majority of "rebels" are blissfully unconcious of that! ), and try to fight it by hiding behind *principles* they made up. Rebel miners, look inside your hearts, search your feelings and you will realize that getting blown up was both the most exciting and the most human thing to happen to you the past weeks/months/years of pseudo-playing eve. This discussion is not about whether or not bumping and ganking are valid game mechanics, or whether there is some kind of obscure moral line that using these mechanics crosses. Its about miners being utterly unable to interact in this environment, which is caused by wasting away hour after hour in afk-mining-induced stupor. rebel miners are players just like you and me, they might have yearnings for danger once in a while. the issue is that they were brought to eve under the notion that the point of eve is the economy. if you think about it, whenever eve hits public headlines, it's always about the amount of isk lost, how eve has a robust economy, etc. eve's pvp gameplay is also not really that fun compared to action mmos. it hence logical to conclude that players that don't play for ingame economic benefit are "playing the wrong game". if they are antisocial as well, it's unlikely they'd get into group pvp, and if they don't have the skill training, it's unlikely they'd get into solo pvp. hence, high sec mining. hence, passive pvp. hence, they are unable to mount any resistance.